Let me just give you a run down of how our last admission went. 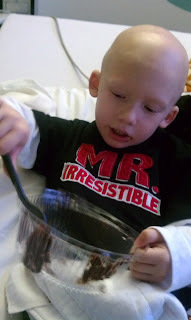 Drew woke up Thursday morning and was feeling pretty lethargic, but otherwise seemed happy. He just wanted to lay in bed and watch TV. I knew he was going to need blood, so I was hoping that that was all it was and not a fever coming on. I took his temp and it was 99, not high enough for us to have to go in, but something to keep an eye on since I knew his counts were bottoming out. Our homehealth nurse came and drew his normal scheduled labs and everything was low with an ANC of 0. 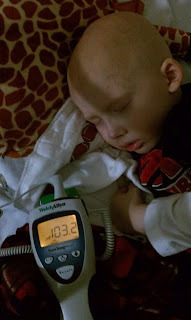 I took his temp about an hour later and sure enough he was up to 101. Off to the ER we went. It was unusual for us to be there at the ER during normal business hours and not the weekend or middle of the night. Things were moving along smoothly and fairly quickly. We went through the usual routine of labs and blood cultures, fluids and antibiotics while monitoring blood pressure. Then the registration lady came in to give Drew his ID band and then went to put mine on me. As she went to put the BLUE band on my wrist, I think my exact words were, "oh no no, we are purple" (referring to hem/onc on 4West - each floor is color coded). She proceeded to tell me that 4 was full and we were going to 7. "Oh, well what's on 7?" was my reply. Again, let me remind you that we are in the ER because my child is severely immunocompromised and requires close monitoring for any type of infection and coverage with antibiotics and antifungals even without any known infection. But back to my question, "what's on 7?" Ready for this one? Both nurses and registration lady say, "infectious Disease." INFECTIOUS DISESE?! You're putting us on the INFECTIOUS DISEASE floor?! As they were monitoring Drew's blood pressure to make sure it didn't drop too low, I asked if they wanted to check mine b/c I guarantee it was anything but low! After a lot of back and forth, it appeared that we really didn't have any other option and they assured us that they would get us down to 4 as soon as a bed opened up, hopefully later that night. We made it up to 7 fine and held our breath through the hall (just kidding - kinda). We were in our own room and made sure our nurse knew that we were on high alert for any cross contamination or handling of things differently than we are used to. It's just that the nurses on that floor aren't used to handling a central line as often and aren't as familiar with administering his meds or TPN. Everything worked out fine even though they didn't get us down to 4 until the next day, but it was just added stress as I felt like I had to oversee everything. His fever only lasted about 24 hours, so after another 24 hours being fever free, 48 hours of negative blood cultures and an ANC on the rise, we got to come home yesterday! 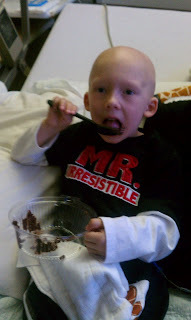 A little Portillo's chocolate cake would have anyone feeling better! Ok, so he only ate the icing off the lid and I ate the rest of the cake!